Staying with the coaching theme. My craft. It’s development y’all. Long term, medium range, and this weekend. Making hard decisions so the athlete doesn’t have to. Making the right decisions because the athlete has put their trust in me. And being able to explain to them the whys and hows. Results. Incremental always best. Difficult and achievable. Rewarding. Motivating. Instilling confidence. New plateaus leading to breakthroughs. I meet Client #1 only once a month but with continuous contact. Dialing in current fitness and real life, melding the two into an intricate web of specific work to achieve attainable goals. I’d love to bottle her determination and will to succeed. The Runde lads. My dossier of detailed notes now in its third year. Being able to reflect on where they started, where they’ve been. Describing where they will be. Their absolute trust in my methods. Seeing them brim with confidence as well as speed. In It To Win It, don’t doubt it. Taking their lumps with grace and respect, part and parcel of our sport. Sam 13 and Jackson 10, both futures so bright they have to wear shades. I’m betting I end up on Coach Mingo’s Christmas Card list. Our Nebraska Run Guru Elite athletes. Not all but several. Goals and aspirations and willingness to listen and do the work all that is required. My craft and passion. Your results. The Bar None, center of the running world. This entry was posted in Uncategorized on June 30, 2016 by runguru. On the wall, who’s the least apathetic of all? Take a couple of shots, get up and then a couple more and yet another and another and another. It would be easy to throw in the towel, but nah. The good old anti-social media is having another heyday at my expense. I’m staying out of that ring, that dog pile of disappointment. Preferring to let this bout play itself out as it will. Not because of apathy though. This fighter still remains. At issue is my profession as a coach. I receive a lot of emails, facebooks, and phone calls. Most people are comfortable with the fact that I charge for my services. I also do quite a bit of volunteer and charity, strictly at my discretion. After 30 years should I not have the luxury of charging for my expertise? Expertise? Hubris! Yes, that’s why people seek me out. I met with my youngest charges for track work on Monday morning. Had them out for road work yesterday, will meet them again Thursday morning for a final tune up prior to this weekend’s AAU Regional Championships in Minneapolis. This morning I’m headed to “the city” to meet my most challenging client, she of the totally crazy travel schedule and list of shiny new personal bests. In the meantime I’m keeping up with 12000 square foot of serious garden. And sundry duties necessary to keep the Bar None in tip top shape. I have to answer to one person only, not the facebook throngs. Who’s the busiest coach of all? This entry was posted in Uncategorized on June 29, 2016 by runguru. Banner news is everyone’s favorite Kaci Lickteig is the 2016 Western States Champion. Her main competitor Magdalena Boulet took a week’s worth of illness to the start line and never made it much further. Doesn’t at all diminish the well deserved laurels. My take is this. Mags is in her 40s, Kaci in her late 20s. Going Early. I declared it would be a quantum leap if Kaci could claim the title, I’ve rethought that position. Kaci is the new face of ultra running. Instead of taking the traditional route of national class marathoner moving up, she takes youth and exuberance and talent and that magical fast/slow twitch gift to the genre. Darned proud of our mates Pete & Kyle too. Pete in under 20 hours, Kyle ever the soldier in 25 and change. Jeff Gregg too, now having mastered the Black Hills 100. Kevin Joerger knew the drill going in. Go Early. For the first time in my memory young Seth Hersh actually trailed in a race. Chasing Kevin. He of juevos mas grande de todos. Forcing the pace, the only way to have a chance against the wunderkind. Seth catching him on the second hill and besting to the line by 20 or so seconds. Chink Chink goes the armor. I’m reminding you that Kevin’s 5K track personal best is 14:10. Nurturing that talent along in proper order. Sam and Jackson Runde also racing well, Jackson scoring a personal best and Sam learning the exquisite agony of 2 miles of side stitch. Every difficulty, every pain, every suffering tempering this future champion. Stacy Shaw captured the masters $$ at Cornfield Cornfield. John Tully scoring an age group pr. No one off course this year. Luka made a rare appearance for the win, Michelle Paxton same as she ever is. Jay Welp, Go Early! He did just that in the men’s 5000 at Club T&F Champs. 9:50 through 2 miles before his hip blew up. Discretion the better part of valor, I scratched him from the 1500. He’ll be back. This entry was posted in Uncategorized on June 27, 2016 by runguru. Thanks for checking in this Friday morning. Sporadic columns means a lot of time in the field. Compounding that is our internet service out here in the boonies. It took a full 10 minutes for my dinosaur of a computer to connect. New one being assembled as we speak (thanks Kevin). Some really big races this weekend and none more epic than Western States 100. Or Pete & Kyle’s Most Excellent Squaw Valley Adventure. Kaci Lickteig too, seeded second only to last year’s winner Magdalena Boulet. Having worked with both athletes I’m qualified to say if Kaci pulls the upset it would be a quantum leap in women’s ultra running. Kaci’s marathon personal best is close to 20 minutes off of Mag’s. She has found an heretofore unknown muscle fiber that is both fast twitch and slow twitch, maybe a magical 50/50. Wishing great racing to everyone! Jeff Gregg is running the Black Hills 100 Miler. Man, these ultra cats. Jay Welp is running the 1500/5000 double at historic Franklin Field in Philadelphia. The only USATF Nebraska Association athlete to attend. Its a start. John Tully and Stacy Shaw are running Cornfield Cornfield 10K. Kevin Joerger is not. Kevin will be racing the Road To Omaha 5K. I only threw one name for him to get. Joining Kevin will be our young men, Sam and Jackson Runde. You’ll notice them in kit, have to run fast to finish in front of Sam. Pete has done things, and more, that appear only in my vast collection of running books. To know this dude, and the way he dreams, makes him one of the most impressive distance men I’ve ever known. This entry was posted in Uncategorized on June 24, 2016 by runguru. I noticed just one second less of daylight yesterday. Seasonal changes always a highlight of each year. Onset of summer means a lot of things. Foremost for the Bar None is having everything in the ground and growing. Towards that end I’ve cut and staked 112 tomato cages, have begun the same task for the 110 peppers. No flop is the goal, keep all the fruit up and clean as a whistle. Cleanliness is a way of life. We host open houses to showcase our attention to clean. We invite our restaurant partners to visit unannounced, surprise inspections if you will, towards the same end. Same goes with our athletes, ahem. Clean as a whistle. No excuses or justifications or lies. No magical improvements by non runners, you’ve seen it and so have I. Whom would you rather have on your team? Pre or Ryan Hall? You might be taken aback by how much of a generational divide lies in the answer. I’ll take Pre’s sneer every day. Big racing opportunities this weekend. Imagine for a moment that I’ve got a former national champ coming for a visit tonight through Sunday. He/She wants to run a competitive race as part of regular training. I reach out to the local offerings and find that the CWS Road to Omaha is the only one still accepting registrations. That’s cool, but man I’d like to see him/her race the very best. Understanding the “absolutes” of closed registration and no wiggle room, another departure from the old days when a marquis name trumped a management policy. Race directors of old used to drool over talent. Today’s are all about clean and tidy, no mess, no fuss. Rules are rules, It’s all good. This entry was posted in Uncategorized on June 22, 2016 by runguru. Kicking off with some big tips to our NRGE, Inc Youth, Sam and Jackson Runde. Sam took 2nd in the 3000 (10:17) and 4th in the 1500 (4:51), the former only :04 off his personal best set at last year’s AAU National Champs, the latter a personal best by :02. 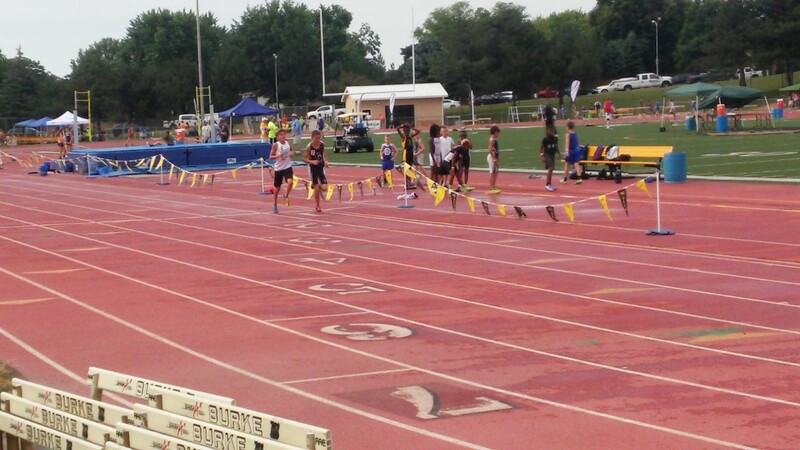 Jackson’s 5:42 1500 was a :05 personal best. And its still June. Had the fellas out for some roadwork this morning. Six easy miles with me astride the bike talking their ears off. About this: Respecting your competition, regardless of where/how they fare on race day. Shaking your competitors hand. Congratulating as necessary. Being friendly even if not friends. Better behavior than I saw from some of the adults yesterday. The USATF Nebraska Youth Champs were my first foray as coach in the meet. Great to catch up with so many old friends, most of whom helped me pull off the 2012 Club Champs at Burke. They all know me and my coaching style. On the fence, urging, hollering, calling loudly, I suppose my voice fairly booming within the confines. Yes, that’s my style, my athletes, their parents, and the meet admins don’t mind. Up in Duluth I was proud of our masters mates David Frost and Matt Olberding. Frosty, despite a difficult work/travel schedule this training cycle hit every workout as prescribed. His personal best 3:12:21 only :13 off the fastest time by a Nebraskan (Austin McKillip, 3:12:08). Matt Olberding, equally as busy pulled off a 3:26:03, great racing by our lads. Elizabeth Woodruff of Papillion was first female (unattached I think) from Nebraska in 3:15:10. Team Nebraska masters ace Theresa Gosnell (44) showed well in 3:34:33. Some regionally familiar names in the accompanying half marathon. Joe Moore of the Kansas City Smoke was 4th overall in a fine 1:05:08. Tanner Fruit was 10th in 1:06:13. Mason Frank was 12th in 1:08:14. Michael Rathje was first Nebraskan finishing 18th in 1:09:03. Ryan Dostal of Omaha was 25th in 1:11:17 and Tom Nichols was 49th in 1:14:52. All 3 running for LRC Racing. The Dizzy Goat 3/6/12 hour runs were also this weekend but typically and for the life of me I can’t find any results. Sam battled his long time friend and competitor bravely in Saturday’s 3000. Trading the lead several times, raising his stock with each lap. Outkicked in the last 30 meters. Hard to see in the picture that Sam ran the last 3 laps with only one shoe, de-spiked by a slower runner being passed, a great learning experience. This entry was posted in Uncategorized on June 20, 2016 by runguru. Bring out the best! Your best. Our best. Racing is like that y’all. When I was competitive, and the culture I cultivate, is to race the best and often. Same with training. You don’t get better at playing tennis with those less skilled. Same with racing. So I call you to find those at your level or a little better and give them all they can handle. Week after week, month after month. There will be no shortage of athletes to fill your dance card. After all, there’s always someone faster. Good luck and Giddyup to David Frost (Frosty), our mate racing Grandma’s this weekend. That is all for this Friday. This entry was posted in Uncategorized on June 17, 2016 by runguru. Our mate Matt Olberding is racing Grandma’s Marathon this weekend. Quiz: If you hear someone saying they are running Grandmothers would it make you flinch. Does me. The Heartland Half Marathon is put on by Tom Whitaker and the Omaha Running Club. It has been named the RRCA Midwest Region Half Marathon Championships. The HITS Marathon is hosting the Nebraska Association USATF Championships. The Nebraska Marathon is put on by Joe Sutter. Not a designated champs but should be competitive none the less. Three marathons in Omaha this fall. Dizzy, my head is spinning. Linda, Jackson, & Sam Runde, moi. 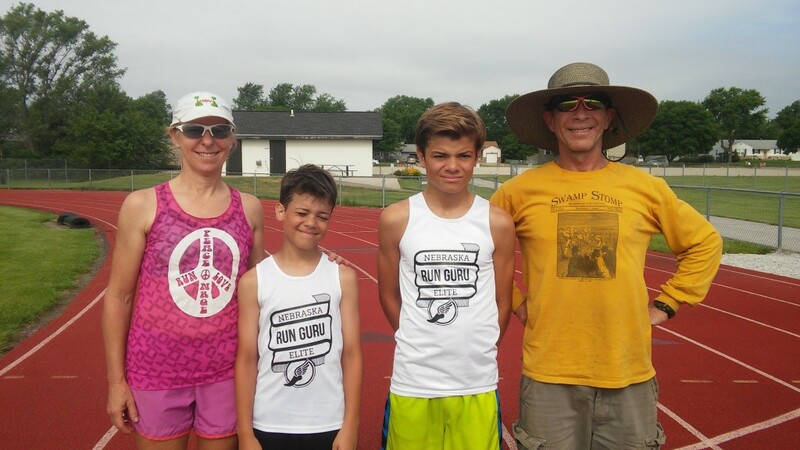 Our Nebraska Run Guru Elite, Inc. youth division. Sam now nearly as tall as his coach, and ever so much faster. Jackson likely to catch Coach Linda before the end of this year in height, his speed also surpassing. We’ve been working on Jackson’s start, shaving seconds off with slight adjustments. Sam, all business. He knows the competition and can’t wait to get some. I put a little bug in his ear about a fella the same age from Gretna, a race I’d like to see before the end of this season. Both the lads will be lining up at Burke this weekend. No hashtag rockstar hashtag strike a pose hashtag squat. Just racing with talent and humility. I’m old enough to be their grandpa. This entry was posted in Uncategorized on June 16, 2016 by runguru. Took man millennia to figure this one out. And according to my old buddy Tim Dooling, the beginning of the end. He’s on to something. Always upfront with the corrections, thanks to Logan Watley for pointing out that LRC Racing scored a Women’s DMR bona fide (12:47.90) back in 2012 at Burke Stadium, I’ve amended my records list posted yesterday. That compilation was a labor of love with a purpose. For all the hand wringing, teeth gnashing, and beard pulling about the state of our Nebraska Association’s LDR program, yesterday was a reminder that this wheel has already been invented, perfected. Again, take a look at those results if you doubt it. Nebraska LDR once (2004-2012) held the respect of the entire national USATF community. Recognized as a leader of Elite Development in fact. 2008, Olathe KS. 2009, Icahn Stadium, NYC. 2010, San Francisco. 2011, Icahn Stadium. 2012, Burke Stadium, Omaha. 2013, Icahn Stadium. 2014, Tacoma Washington. 2015, Icahn Stadium. If you studied you found that nearly every single one comes in that short 9 year period that I herded every cat in the association. Please don’t view this as sanctimonious dribble. Rather a paean on how it happened, why it happened. It was based on passion to serve, advocating for potential, setting the bar of excellence for future generations. No athlete from Nebraska, despite 3 fully funded clubs, could muster a single athlete for the 2015 Club T&F National Champs, one of the programs Nebraska LDR was founded on. Was founded on. Let that sink in a moment. Don’t doubt it. You’re hearing it from one end of the horse, depending on whom you are, message remains the same. Our LDR program was founded on excellence. And pitting those against the very best the other clubs around the United States had to offer. The path of least resistance would have been to quietly fade into my garden. To put it all behind and be satisfied with my place in Nebraska post collegiate history. No way. If building it the first time is part of my legacy, resurrecting it will be my crowing achievement. Towards that end, Jay Welp will be competing at Franklin Field in Philadelphia at the end of this month. The 1500/5000 double. Taking the Nebraska Run Guru Elite singlet to the biggest of our USATF Club stages. We flexed our muscle at Living History Farms, Shamrock Shuffle, Lincoln Half, and most recently Dam to Dam. The best team competitions we can find in the midwest region. Up next the 44th annual Midnight Madness 10K. Always good to catch up with Roman Lynch. We’ve accepted his kind offer to get us on the line. In exchange for his support I’ve promised all the racing he can handle. Heads up! We’ll be at Cornfield Cornfield, yes we will yes we will. And at the Thunder Run. And a downhill mile. Supporting and competing at our Nebraska Association Championships. Come get some. This entry was posted in Uncategorized on June 14, 2016 by runguru. All marks through 2012 by Team Nebraska Brooks excepting Men’s Triple Jump and Women’s 10000 which belong to LRC Racing. Marks after 2012 by Team Nebraska. Thanks for understanding and accepting differences between the twain. 100 METERS MEN- 11.71, LeRon Williams, 2010 WOMEN- No mark 200 METERS MEN- 21.40, Virgil Mitchell, 2012 WOMEN- No mark 400 METERS MEN- 48.69, Virgil Mitchell, 2012 WOMEN- 53.18, Angee Henry, 2009 800 METERS MEN- 1:52.75, Nick Suing, 2009 WOMEN- 2:07:05, Angee Henry, 2009 1500 METERS MEN- 3:56.38, Matt Schneider, 2010 WOMEN- 4:29.45, Ashley Miller, 2014 5000 METERS MEN- 14:53.60, Luka Thor, 2010 WOMEN- 17:22.82, Michaela van der Westhuizen, 2010 10000 METERS MEN- 30:28.51, Luka Thor, 2010 WOMEN- 38:30.00, Frankie Peterson, 2012* LRC STEEPLECHASE MEN- 9:06.02, Matt Pohren, 2012 WOMEN- 10:45.99, Megan Zavorka, 2012 WOMENS 100 METER HURDLES- 16.45, Jadrianne Lippman-2009 MENS 110 METER HURDLES- 13.97, Virgil Mitchell- 2011 400 METER HURDLES MEN- 51.96, Virgil Mitchell, 2011 WOMEN- 1:09.42, Jadrianne Lippman, 2009 RACE WALK MEN- 34:11.61, Paul Wilson, 2010 WOMEN- No mark POLE VAULT MEN- 4.88m, Nate Polacek, 2012 WOMEN- No mark HIGH JUMP MEN- 2.10m, Randal Carter, 2009 WOMEN- 1.55m, Jadrianne Lippman, 2009 LONG JUMP MEN- 7.18m, LeRon Williams, 2010 WOMEN- No mark TRIPLE JUMP MEN- 13.43, Kevin Janata, 2012 *LRC WOMEN- No mark SHOT MEN- 16.48m, Jared Schuurmans, 2012 WOMEN- 15.60m, Aubrey Baxter, 2013 DISCUS MEN- 52.98m, Jared Schuurmans, 2012 WOMEN- 47.39m, Jenni Steiner, 2008 HAMMER MEN- 56.98m, Ross Bunchek, 2012 WOMEN- 63.08m, Aubrey Baxter, 2013 JAVELIN MEN- No Mark WOMEN- 37.45m, Aubrey Baxter, 2012 4 x 800 MEN- 7:44.11, Evan Knight, Michael Beatie, Shannon Stenger, Nick Suing, 2009 WOMEN- No mark** contested in 2012 but time not acceptable for competition purposes DMR MEN- 10:14.40 Michael Saalfeld, Matt Schneider, Nick Suing, Shannon Stenger, 2010 WOMEN-12:47.90, Erica Hamik, Amber Brandenburger, Nora Young, Frances Peterson, LRC 2012 . This entry was posted in Uncategorized on June 12, 2016 by runguru.